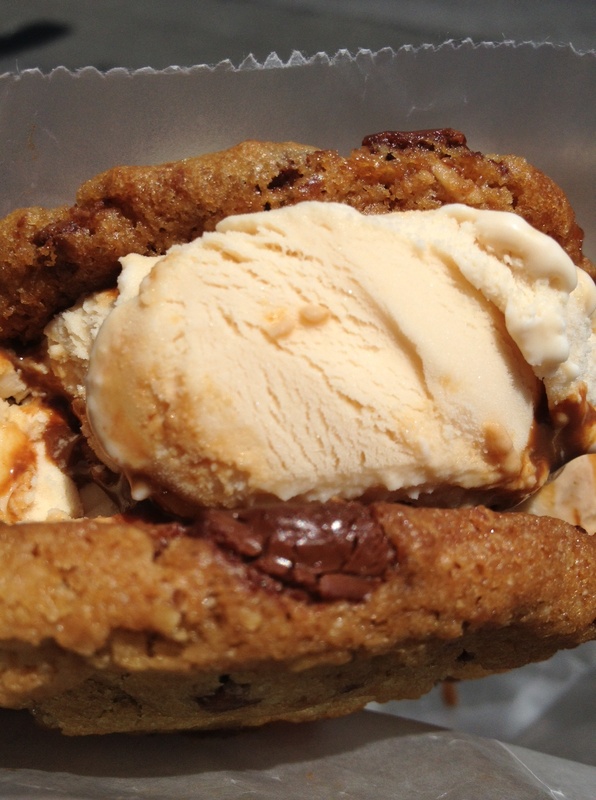 What better way to relish the dog days of summer than with a really good ice cream sandwich? An ice cream sandwich, just like most really great treats, is all about the contrast in textures. You have the soft, chewy–alternatively, dense, crunchy–cookie (or other delivery device, as you shall see below) and the cold, smooth ice cream. 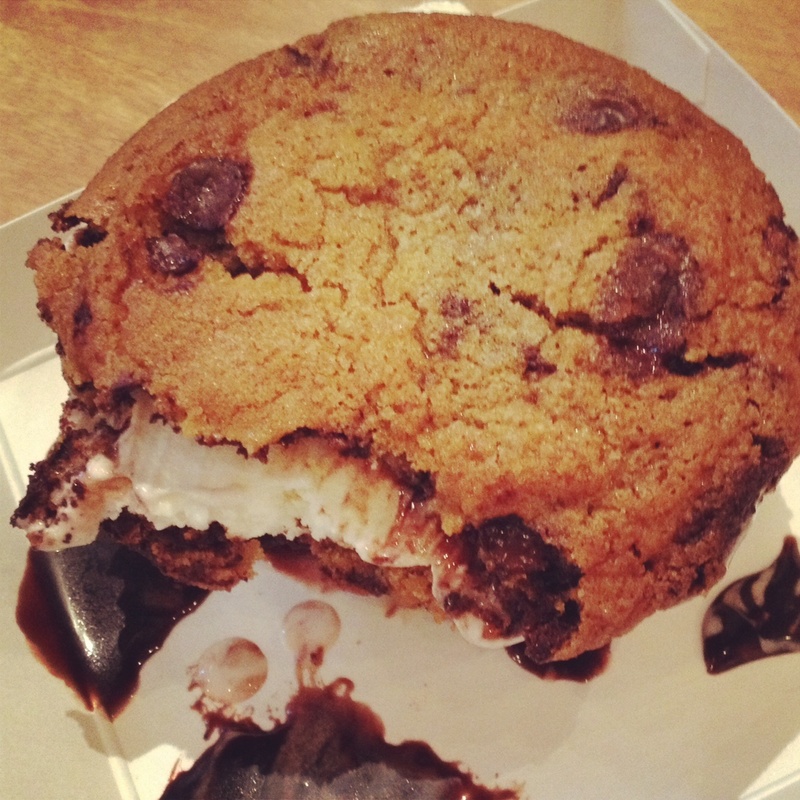 All of this is why, in my expert opinion, the best ice cream sandwiches are made-to-order. An MTO ice cream sandwich is not an easy find. Many of the city’s most-touted ice cream sandwich suppliers, including Melt Bakery, The Good Batch, Jacques Torres Chocolate (you can get non-pre-assembled sandwiches at two locations, but they insist on only using frozen cookies) and Bierkraft, keep pre-made sandwiches in a freezer. I’ve tested my sensitive teeth too many times on frozen solid cookie. Which is why I’ve scouted the city for well-made MTOs. You’re welcome. A longtime favorite dessert, the chocolate chip cookie ice cream sandwich ($6.95) at Dessert Club ChikaLicious in the East Village is everything you’d want from a delicious summertime treat. The cookies are chewy if not downright out-of-the-oven-warm, and the in-house vanilla soft serve is rich and satisfying. A few squirts of hot fudge are exactly what you didn’t know you wanted. 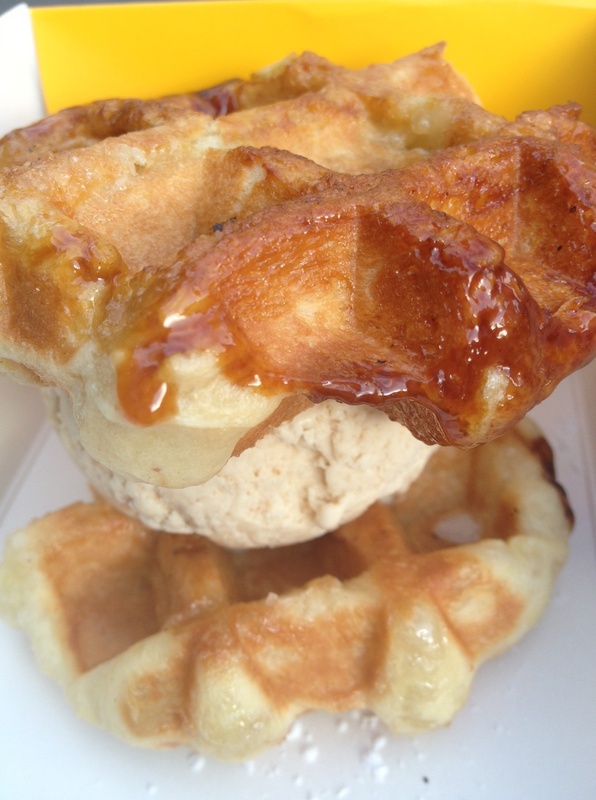 With endless ice cream and cookie flavor combinations, including unique offerings like fried chicken and waffles (ice cream) and peanut butter captain crunch (cookie), the Coolhaus truck, with mutliple locations around NYC and elsewhere, is the king of the MTO ice cream sandwich. On a recent visit to the CPW location, I paired s’mores cookies with a chocolate-stout-and-pretzel ice cream. The cookies had just the right texture, thin and pliable, and the ice cream had a lively beer-y kick. If you’re really looking to diversify, ask for two different cookies as I’ve done on more than one occasion. They’re more than happy to oblige. When I was first handed the above sandwich from Roneybrook Milk Bar ($3.50) in Meatpacking District’s Chelsea Market, I was a tad disappointed. I could tell the cookies were hard and was worried I’d have trouble biting through them. But then I started eating. And, well, I couldn’t stop. The cookies were dense, yes, but not in a stale way. They had an appealing crunchiness with oversize white chocolate chips that broke up the texture. The cinnamon ice cream I had chosen was simple but incredibly creamy with the perfect amount of cinnamon flavor. Carb-laden sweets are my Kryptonite. I had no idea brioche ice cream sandwiches existed until I saw one advertised at a now-defunct Midtown East Italian restaurant five years ago. At Amorino in Greenwich Village, their sandwich, called a Foccacina ($7.50), combines a sugary brioche with two of their gelato offerings. The gelato at Amorino is not to be missed, with two types of pistachio and all of the best Italian classics (despite the chain being of French origins). I went for the saltier of the two pistachios coupled with the hazelnut. The scoops were stuffed into a small-ish roll and dusted with powdered sugar. 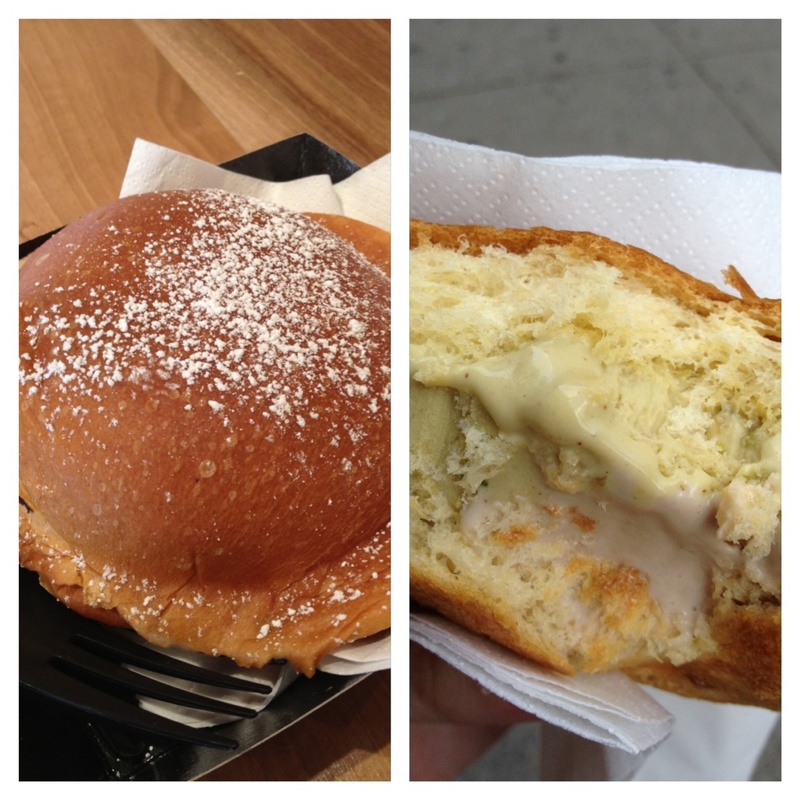 Though the brioche was good, albeit less dense than I prefer my brioche bread, the gelato is the star here. 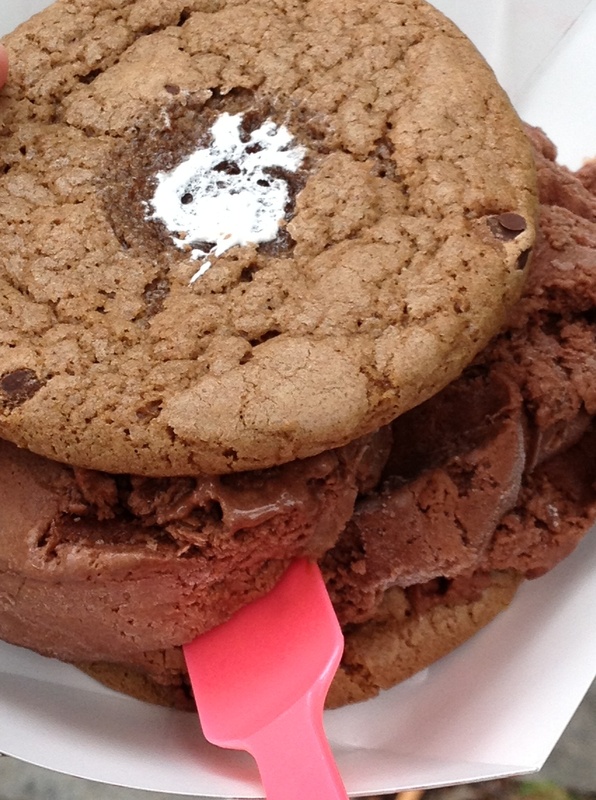 The ice cream sandwich at Milk & Cookies Bakery ($5.50) in the West Village was a knock-your-socks-off surprise. The cookies were chewy, layered and–wait for it–warm. 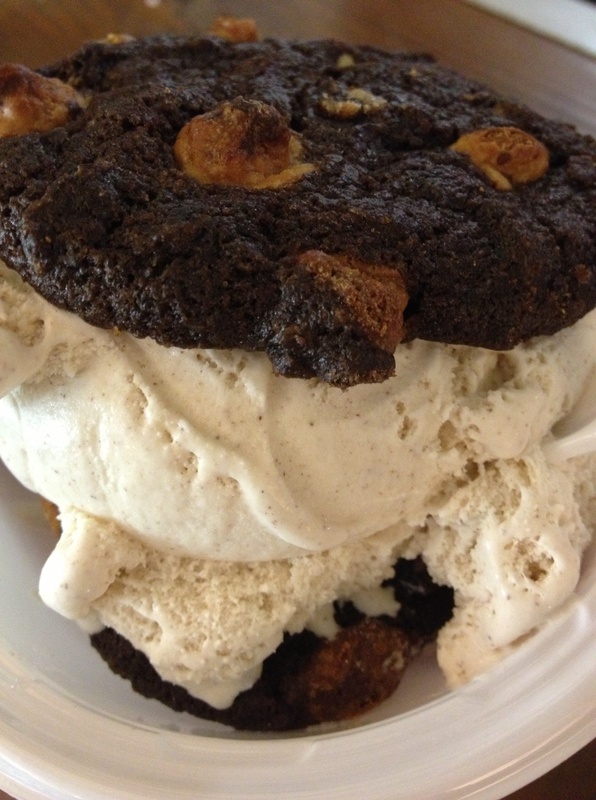 There’s nothing better than biting into a soft cookie and cold, creamy ice cream at the exact same time. I went for a milk-chocolate-and-caramel cookie and paired it with caramel gelato, which they source from city favorite Il Laboratio del Gelato. There are over a dozen cookies and nearly as many ice creams to mix-and-match according to your preference. Since their specialty is cookies, it seems prudent to treat the cookie selection process the way you would picking a bagel. Ask for what’s fresh and warm and use that as your guide. I knew the sandwich at Wafels & Dinges, a.k.a the de Verdekke ($6), was going to be good when I saw the woman working the truck (60th and CPS location) put two mini liege waffles onto the grill. After they warmed, with the beautiful sugar crystal edges you see above, she paired them with a single scoop of their specially made Spekuloos ice cream (a version of their famous spicy cookie spread ) and topped it off with powdered sugar. Yowza. This was delicious. In a way that, when you first bite into it, you’re totally unprepared for. It was warm and chewy and melty and all around satisfying. Plus, it’s small and portable–a perfect dessert for a quick city stroll. Admittedly, it’s not a borough I spend a ton of time in. When I do, I remember how Queens is a New York that is all its own, away from the insularity of Lower Manhattan and the postcard cutesy-ness of Brownstone Brooklyn. It’s the city, both the literal place, as well as what it’s come to represent, distilled to its DNA: a melting pot of people and cultures from every point on the globe. Many neighborhoods in Queens feature distinct, bustling centers of commerce. An Indian enclave bleeds into a Latin American enclave that’s near a Korean and Chinese enclave. It’s a comprehensive world tour packed into 108 square miles. In fact, according to New York City census data, Queens is the most ethnically diverse place on the planet, where residents from 100 countries speak more than 138 languages. A fascinating recent New Yorker article profiling the borough’s Elmhurst Hospital described how the institution, which serves 1.7 million patients a year, has become a lesson to admitting physicians in some of the most obscure diseases in the world. If you’re making a day of it and hitting up multiple spots, Queens is best explored by car, since the borough is large, and there are only two main subway routes through its central section. There is too much to cover in one short post, but below is a good jumping-off point for a beginner’s exploration of the borough and specifically, its food scene. And food, we can all agree, is the best form of cultural introduction. Astoria, the most familiar to Queens’ novices, is a bustling Greek neighborhood, with casual tavernas, diners, fine dining establishments and bakeries. I loved a recent meal of traditional dips and freshly grilled porgy at Gregory’s Corner 26 Taverna. On the weekends, Ditmars Boulevard is a bustling scene of overflowing cafes. Like almost every other neighborhood in the borough, it’s not just Greek, it’s also Arab and Brazilian and Balkan. The popular Kabab Café, run by eccentric owner Ali El Sayed is a must-try for expertly spiced Egyptian dishes. Nearby is Woodside, an Irish enclave with plenty of pubs, including one touted for its burger. Down the Roosevelt Avenue stretch is Jackson Heights, home to South Asian residents and businesses, including plenty of places to stock up on provisions. Further on is the Latin American section, home to taco trucks, Colombian chicken purveyors, a bakery serving delicious filled churros and the famed Arepa Lady, whose late-night arepas con queso are the ultimate post-going-out food. There’s also Rego Park, home to a large Bukharian Jewish population, making regional specialties like plov and chebureki, and Forest Hills and Kew Gardens Hills, with Kosher restaurants and bakeries. Bunker, a new Vietnamese restaurant in out-of-the-way Ridgewood, was recently named the best new “cheap eats” joint by New York magazine. To really appreciate Queens, though, you must go to Flushing–NYC’s Chinese and Korean hub–on a Saturday afternoon or evening. The neighborhood, concentrated along Main Street, has the buzz of Times Square, minus the slow-walking tourists and cheesy chain restaurants. Much of the colorful store signage is in Chinese, touting noodle restaurants, Asian groceries, dumpling spots, hot-pot purveyors, skewered meat stands, bubble tea places and Asian-French bakeries, to name a few of the area’s food options. Explore Flushing’s cavernous mall food courts with these great guides. I’ve eaten at the oft-reviewed $1 duck bun stand at Corner 28, Golden Shopping Mall’s, Xi’an Famous Foods and Biang!, and all have been delicious. I have lots more exploring to do myself, clearly. Dosas, South Asian-style crepes, at the nearby Ganesh Temple’s canteen (which I’ve also tried and highly recommend) are often atop citywide best-of lists. A special shout-out to Bagel Oasis and Brother’s Pizza in Fresh Meadows, my husband’s family’s sentimental favorites. Stay tuned as I share more of the borough (and try really hard not to let the worst street configuration in the country get me down). Taqueria Coatzingo, one of the more popular taco spots in Jackson Heights. Try the lingua tacos.